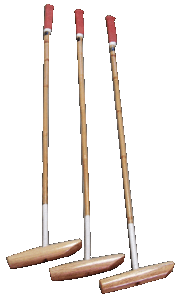 Our mallets are hand made from the best individually selected tapered canes from Indonesia and Malaysia. Players can visit our workshop and choose their canes before the heads, handles and grips are attached. Balancing a mallet is critical as every cane is different. The final feel is up to the individual player. As each player's grip varies, there is a selection of handles including numbers 2,3,4 or custom made, as required. For a strong and reliable head we buy blocks of TIPA wood from northern Argentina that has been matured for at least 5 years. Like good wine, this maturation is essential for it to reach its full potential. All Country Polo Mallets are crafted and repaired by Jorge Scanzi. Jorge has many years experience and was trained in Hurlingham, Buenos Aires, Argentina.